Where would we be without this versatile, starchy tuber? Whether mashed, fried or roasted; russet, red, Yukon gold or purple; potatoes are an integral part of cuisines around the world. There’s one particular technique that gives us the creamy, smooth texture of a baked potato with a tantalizingly crispy, salty texture of a French fry. It’s called Hasselback. While you may have seen this method more recently on Instagram or in a food blog or magazine, its origins start nearly 60 years ago at a hotel restaurant named Hasselbacken in Stockholm, Sweden. The elegant look of the end result belies its simplicity. Note: I used red potatoes here not only because they’re economical and readily available in most markets, but also because they are a waxy, low-starch variety. 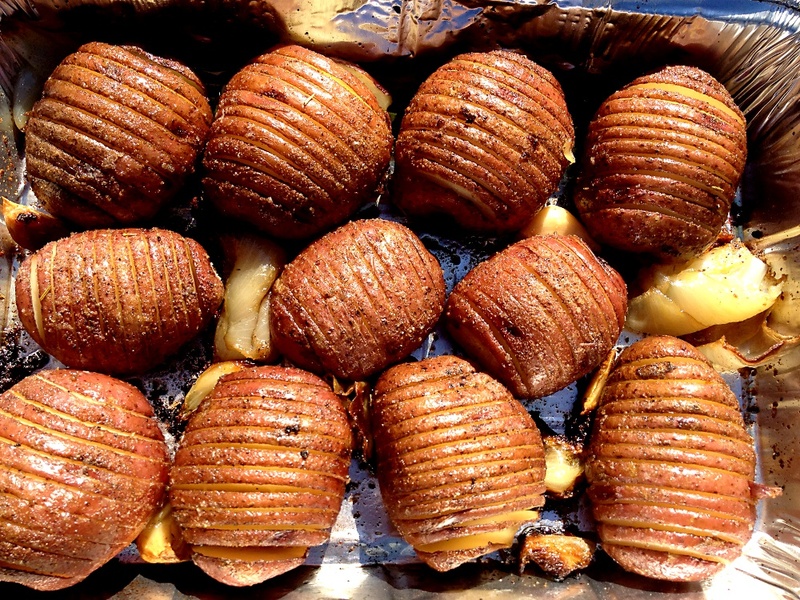 This kind tends to remain firm once cooked – an important factor with the presentation of the Hasselback technique. 1. Mix granulated garlic, granulated onion, salt and pepper together in small bowl and set aside. 2. Melt the butter or coconut oil and set aside. 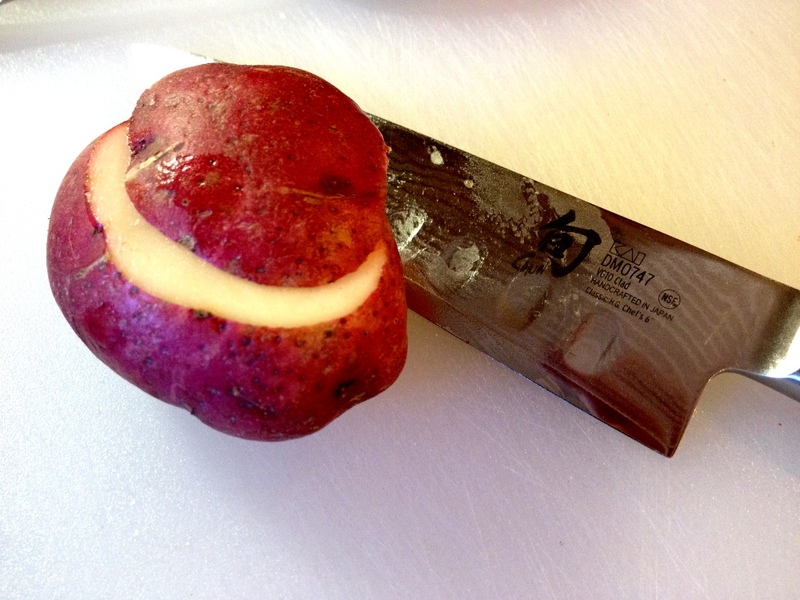 Cut a ¼” slice off the bottom (this is used to make the potato stand flat). 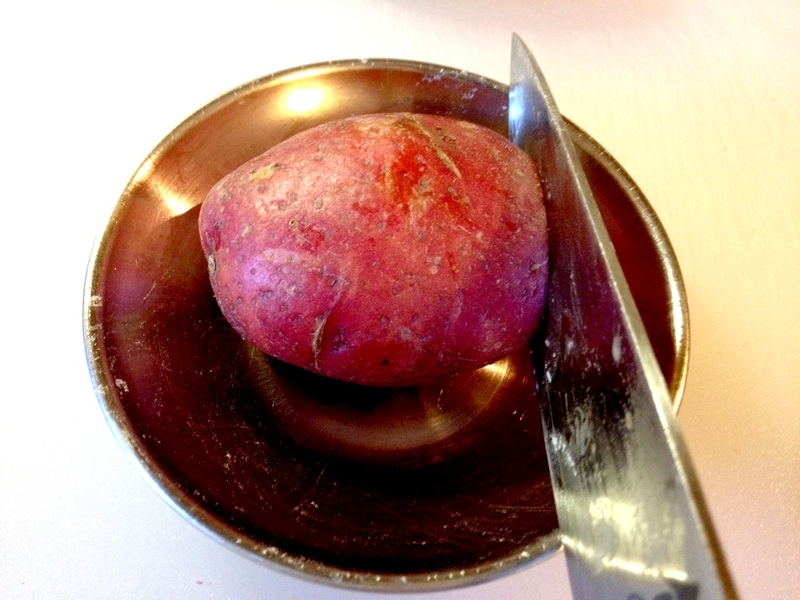 Place the potato flat-side down in a shallow dish or serving spoon. 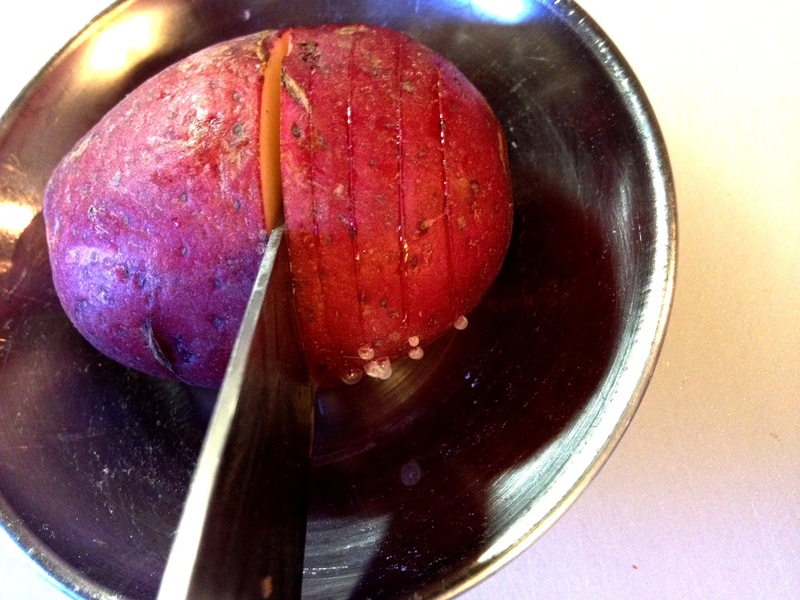 Carefully slice the potato in 1/8” segments. Do not cut through the bottom of the potato and use the dish/spoon as your depth gauge. 4. Arrange the potatoes in rows in the foil pan. 5. Put the garlic and shallots in between the potatoes. 6. Drizzle the olive oil evenly over the vegetables. 7. Sprinkle the spice mixture evenly over the vegetables. 8. Heat your grill to medium-high heat (350-450F) and setup the burners or coals for indirect cooking. 9. Place the foil pan over the indirect area. 11. 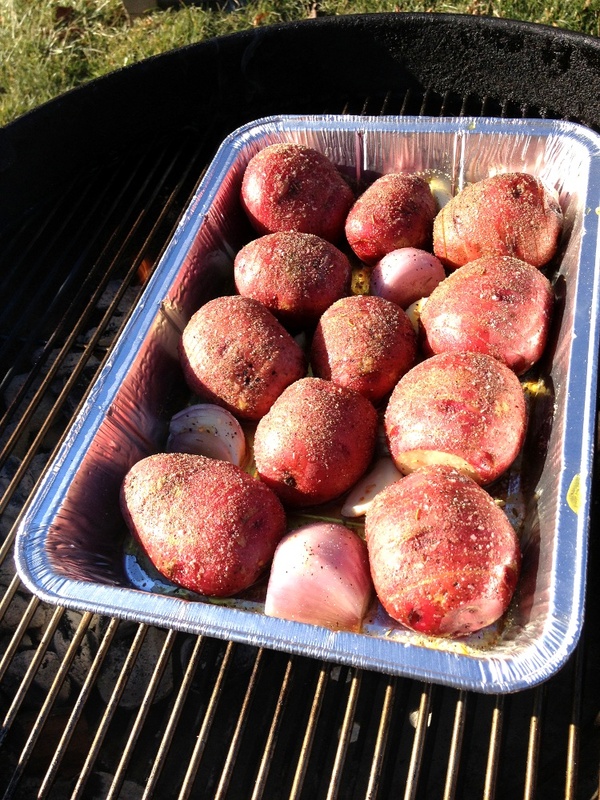 Open the grill and brush a small amount of the melted butter or coconut oil on top of each potato. 12. Cover and cook for 20 more minutes. 13. Open the grill and brush more of the butter/oil on top of each potato. 14. Using a pair of tongs or a pair of grill mitts or gloves, carefully re-position the foil pan over the gas or coals. 15. Cover and cook for 15 more minutes. 16. 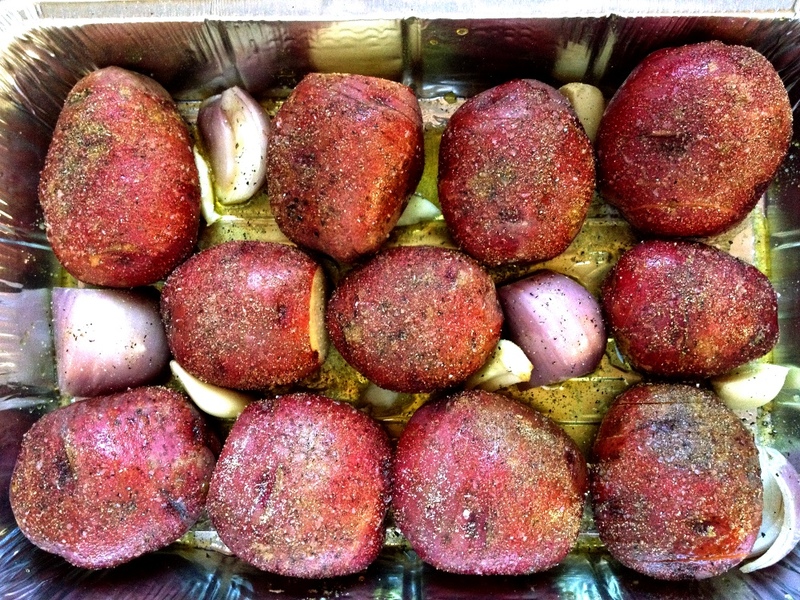 Wearing grill mitts or gloves, carefully remove the potatoes from the grill and loosely cover with foil. 17. Let the potatoes rest 10 minutes before serving. What you should have is row after row of golden, crunchy potato skin bursting with flavor. It should look like the folds of an accordion. Once you dig in, you’ll be rewarded with a perfectly tender and creamy, yet still firm, interior filled with the familiar earthy aroma and flavor of a baked potato. “Would you like Hasselbacks with that?” may not roll off the tongue quite as easily as another familiar phrase, but I guarantee it will raise eyebrows and drop some jaws in a good way.